This is a collection of animals belonging to the Phylum Arthropoda. Millipedes are Arthropods belonging to the Phylum Arthropoda. They have a long cylindrical body made up of many segments, each of which has two pairs of legs. 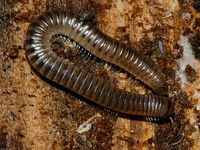 Millipedes feed on decaying leaves and other dead plant matter. 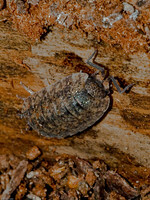 Woodlice have a body of 13 segments, each containing one pair of legs. They breath through gills and therefore are found in damp places. They feed on decaying plant matter and are harmless except when large numbers are present in greenhouses when they may attack young plants. Eggs are held under the body of the female until they hatch, giving the appearance that the female is giving birth to live young. There are about 40 species in the UK.